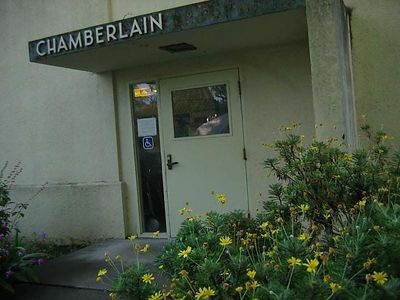 Medical laboratory in Eldridge, CA where I work. Photos taken in 2004. 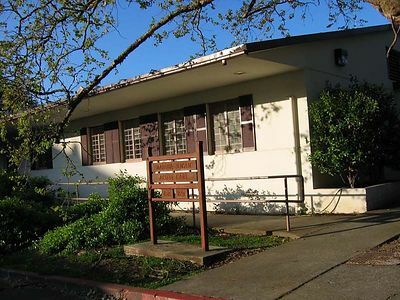 Eldridge is near the town of Sonoma, to the northeast of San Francisco. 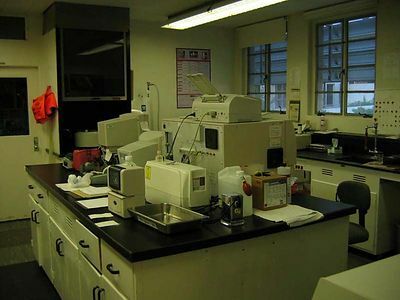 The lab is divided into several sections shown here (Microbiology, Chemistry & Hematology). 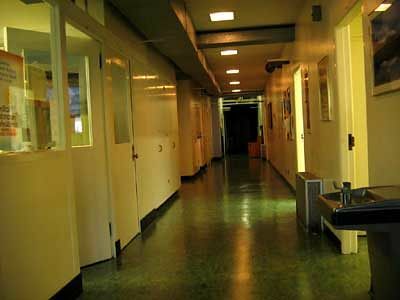 Hallway in the lab - doors lead to different sections. Lab office is first door on left. 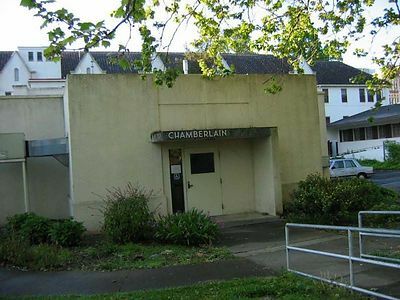 Chemistry section is first door on the right. 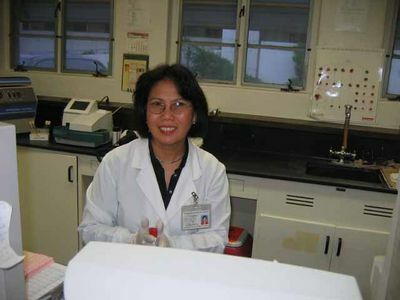 Hematology and processing sections of the lab. Island in picture shows electonic equipment including back of Cell Dyne Automated Hematology System. Ink Jet printer is on top of Cell Dyne. 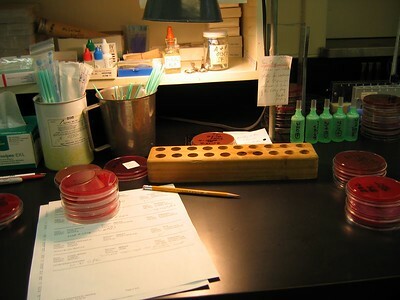 Microbiology workstation in our micro lab. Worksheet shown is used to keep records which are then entered in computer. Agar plates stacked and ready to be checked. 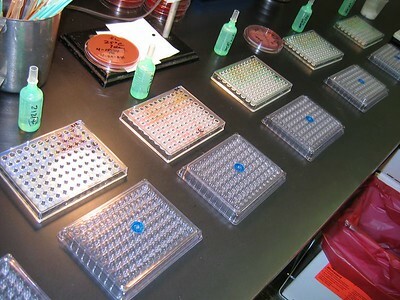 Plates are incubated (at 35 C) overnight before being read the first day, then are usually reincubated one more day. 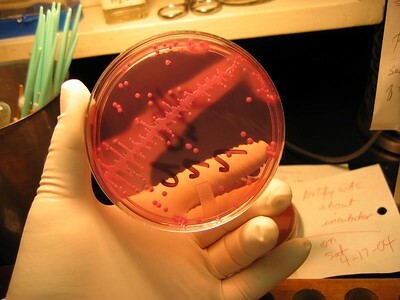 Examining an agar plate. Note colony growth. Size, shape and color of colony growing on plate helps with initial ID. 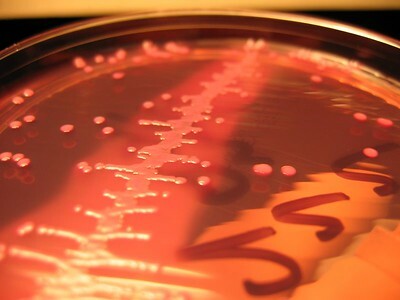 Close-up of plate shows how colonies grow. Single colonies of possible pathogenic bacteria are then picked from plate, diluted, then processed by our labs automated Microscan system. 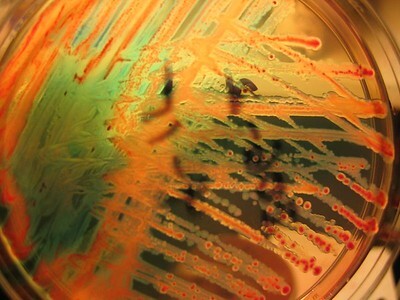 Greenish sheen is from probable Pseudomonas bacteria. 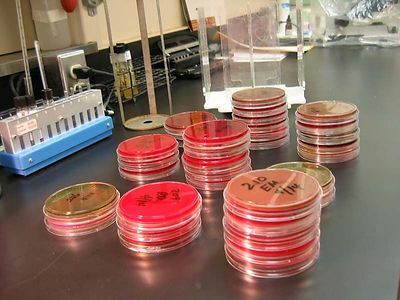 Colonies of bacteria are picked and diluted in green plastic bottles, then are added by microdilution to the flat MIC plates. 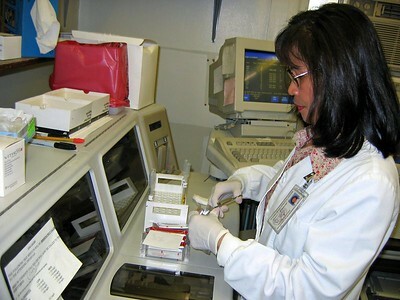 Clinical Laboratory Scientist testing urine samples on the Clinitek automated urine system (see next picture). 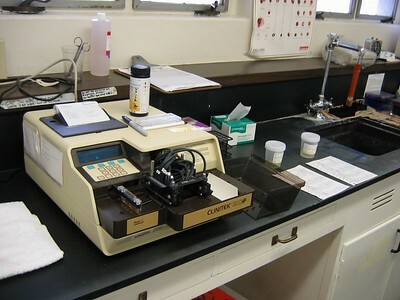 The Clinitek, used by many medical labs to test urine samples. Chemical strips are dipped in the urine, then placed on instrument which reads them. A vial of chem strips can be seen on top of the instrument. 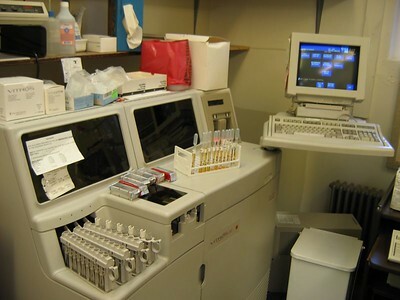 A closup of the Vitros 250, the labs main chemisty analyzer, with tubes of serum samples ready to be loaded. 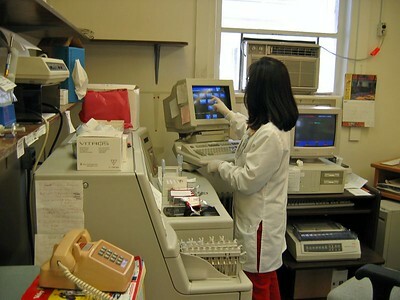 Laboratory Scientist uses a touch screen on the 250 to prepare tests. Same as last picture, continued. 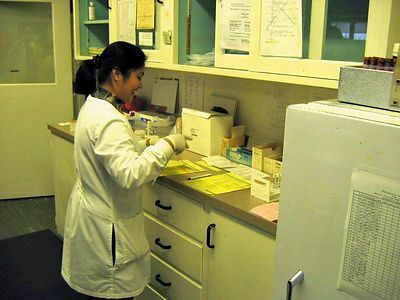 A lab aide in our central receiving and processing area. 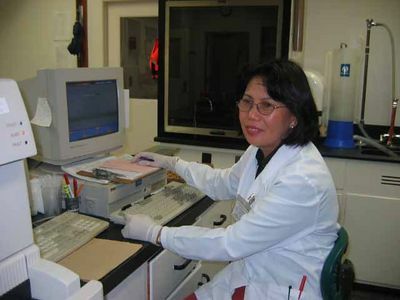 Here blood samples are prepared for analysis. Tubes are labeled, and given a lab ID number for each specimen, then samples are delivered to different departments for testing. 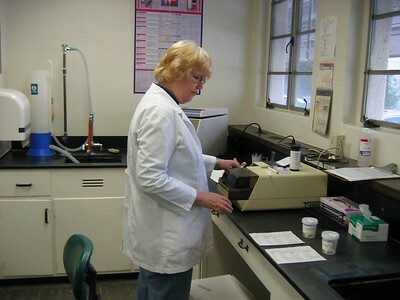 Paperwork being prepared for samples that are sent out for testing. Note red safety blanket in background. The lab has a number of safety devices to protect workers, who handle chemical and bioharzardous waste. 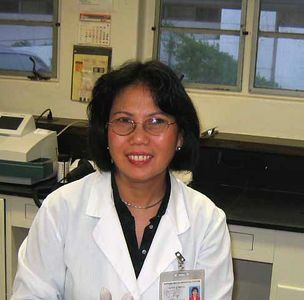 Note worker is wearing gloves and lab coat.